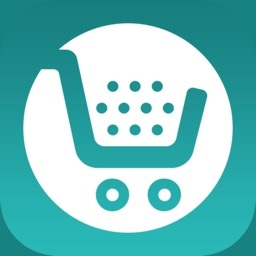 My-Shopping-List is created to help you manage all your shopping needs in one spot. 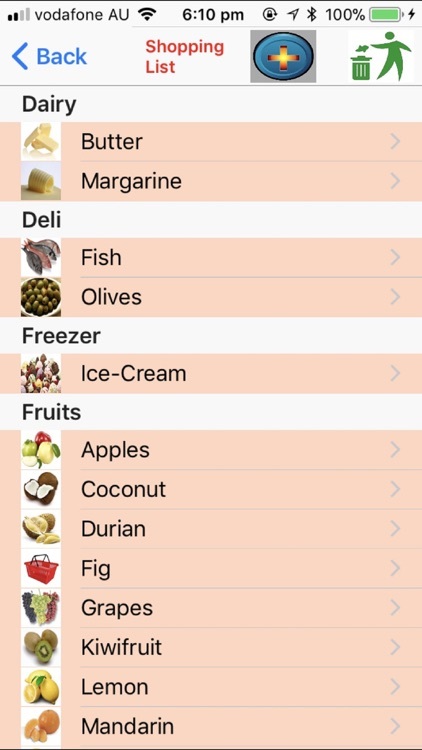 The shopping list will be grouped based on the shop types (supermarket, hardware store, departmental store, services, etc) you choose with options to print (single copy, multiple copies, or page range), email or SMS to your friends. Manage Shops - Enter the shop types. 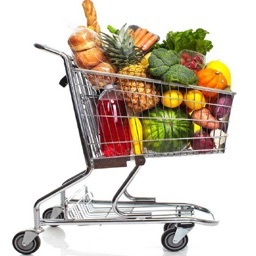 Shop type details (supermarket, departmental store, etc) include shop type, description and a photo. You can select the shop photo from your photo album, delete selected photo or take a new photo. To search for a shop type, simply enter the name and the photo will be shown. You can then change the photo if you wish. You can also delete unwanted shop types. 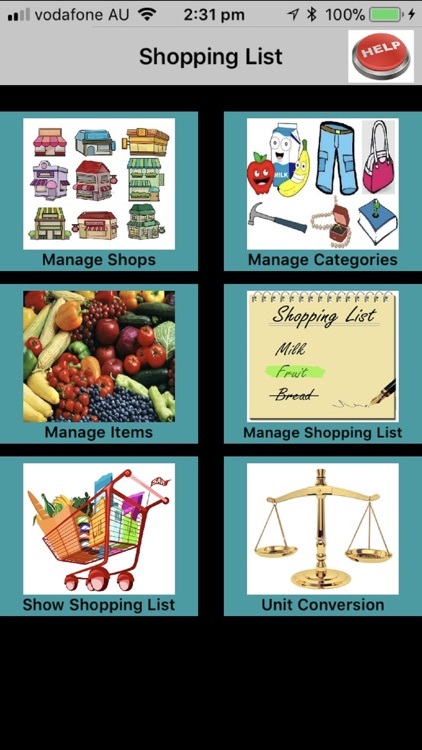 Manage Categories - Enter the category details. 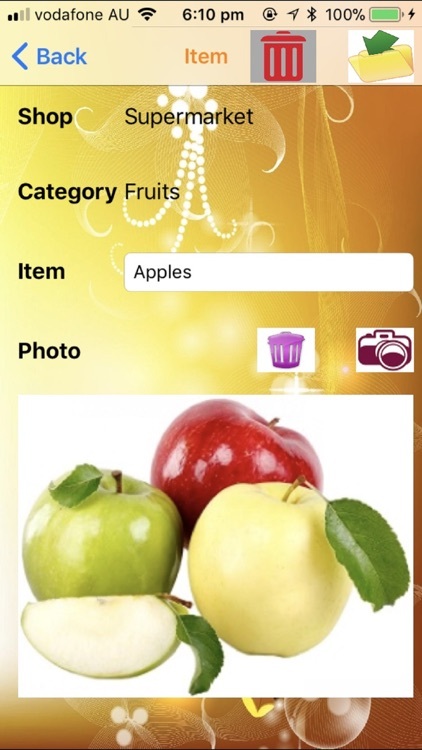 Category details (bakery, fruits, vegetables, etc) include category name and category photo. 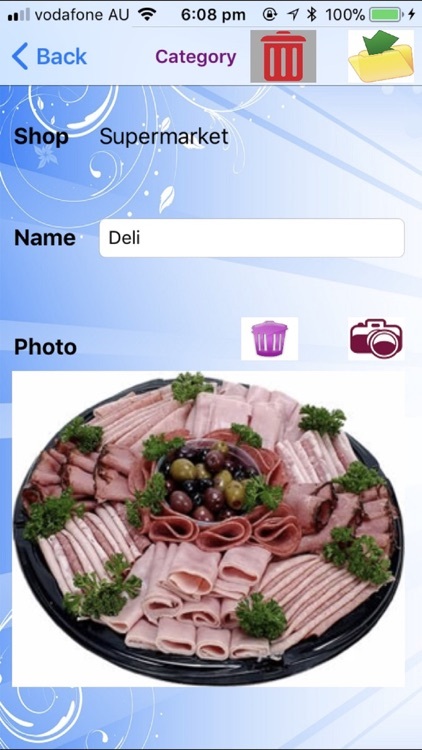 You can select the category photo from your photo album, delete selected photo or take a new photo. To search for a category, simply enter the name and the photo will be shown. You can then change the Category photo if you wish. You can also delete unwanted categories. Manage Items - Enter new items. 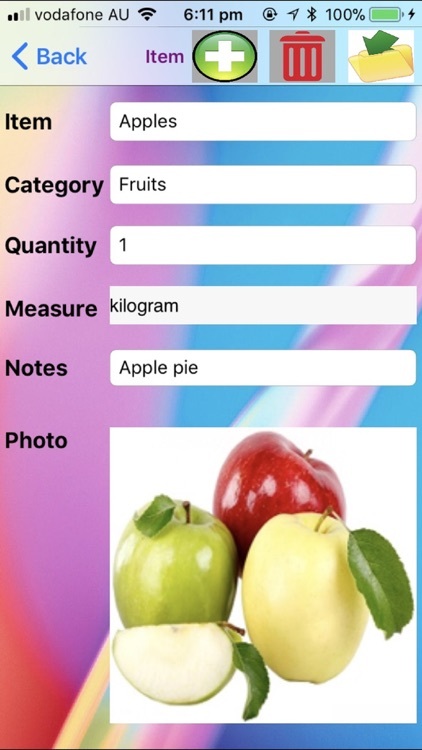 Item details (apple, tomato, cake, etc) include item name and item photo. You can select the item photo from your photo album, delete selected photo or take a new photo. 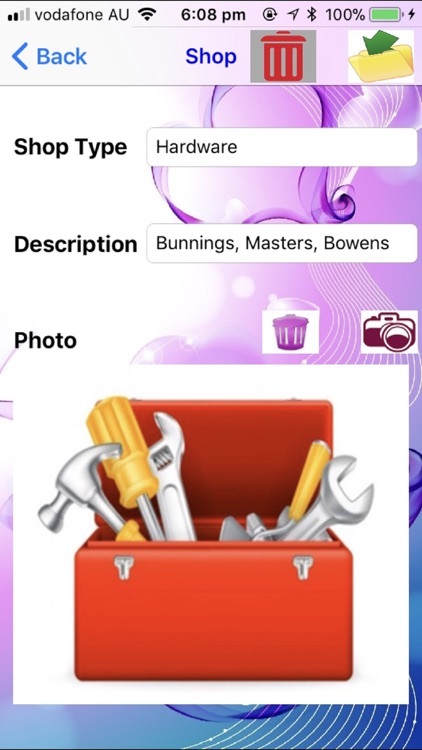 To search for an item, simply enter the name and the photo will be shown. You can then change the item photo if you wish. You can also delete unwanted items. 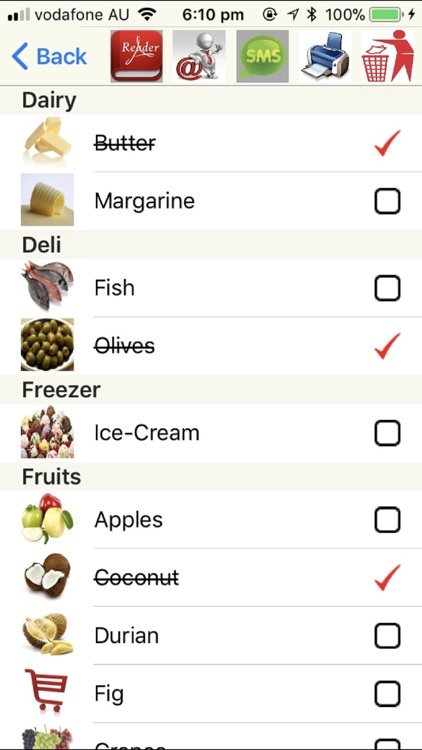 Manage Shopping List - Select items to be included in the shopping list. 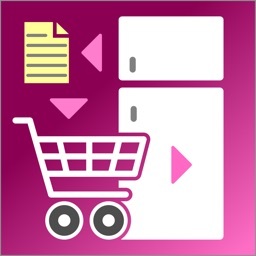 Shopping Items for each shop type includes item name, quantity, measure (kg, litre, etc - metric or imperial) and notes. When you enter the first character of an item name, a picker will be shown to allow you to pick the items starting with the character you entered. Once you've selected the item, the item category and item photo will be displayed automatically. To search for an item, simply enter the item name and the item details will be displayed. You will also be able to change the details. You can also delete unwanted items. 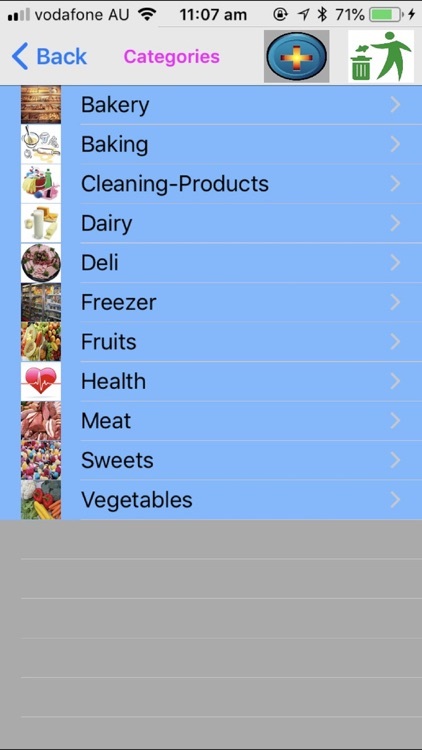 If you can't find an item in the list shown by the picker, you can add new items and category without having to exit. These new items will then be available for selection. 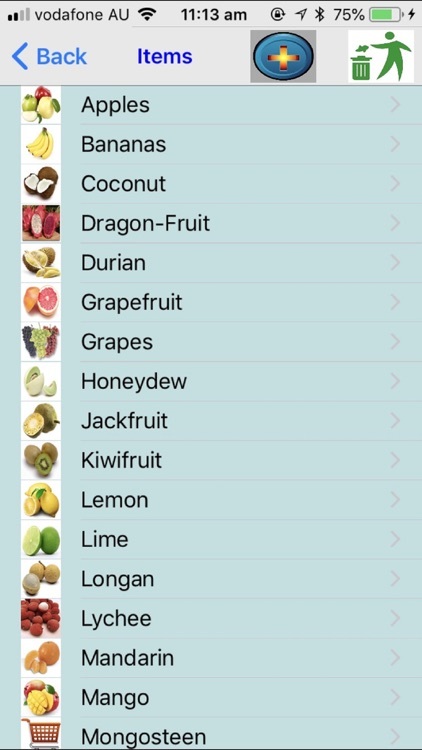 Show Shopping List - This option allows you to display your shopping list based on the shop types. 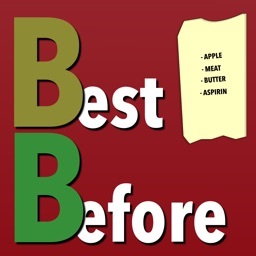 The list can be emailed or printed to an iphone supported printer. You can checked off items purchased. You can then delete these checked items if you wish. 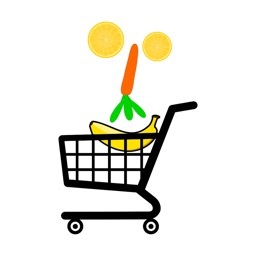 The email will include a pdf file as an attachment and the shopping list will also be shown in the email body. 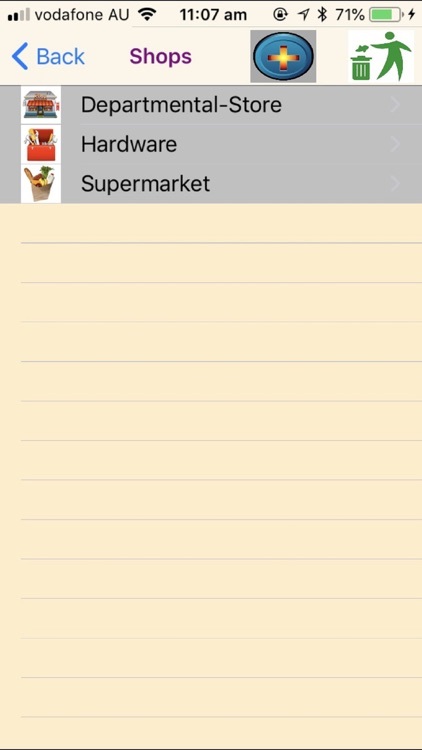 You can also SMS the shopping list or display the PDF file. The pdf file can also be sent to WhatsApp, Messenger, iBooks, Yahoo Mail, Evernote, Notes, Viber, iCloud Drive, etc. Unit Conversion - A 'Unit Conversion' option is provided that gives you a further two functions for conversion: Weight (Metric or Imperial) and Temperature (Centigrade, Fahrenheit or Gas Mark). 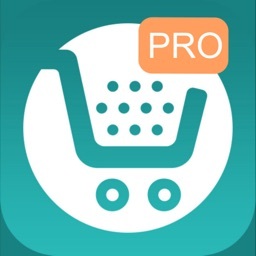 There is also a 'Help' button to guide you in using this app.